WASHINGTON (Reuters) - Top Democrats in the U.S. House of Representatives on Monday demanded documents from the Trump administration over a White House proposal to release migrants from detention and transport them to "sanctuary cities." U.S. media reported on Thursday the administration had considered the idea, which would send migrants and asylum seekers who had crossed the U.S. border with Mexico to districts represented by Democratic lawmakers. The following day, Trump confirmed the proposal, saying in a tweet that he was strongly considering it. Sanctuary cities are local jurisdictions that generally refuse to use their resources to help enforce federal immigration laws against undocumented immigrants that could lead to deportations. The localities say they do not have any responsibility to involve themselves in federal enforcement and doing so could impede policing efforts within communities. Since many of these jurisdictions are represented by Democrats, critics saw the plan as a way to taunt Democrats by dangling the possibility of an influx of illegal immigrants into their communities. 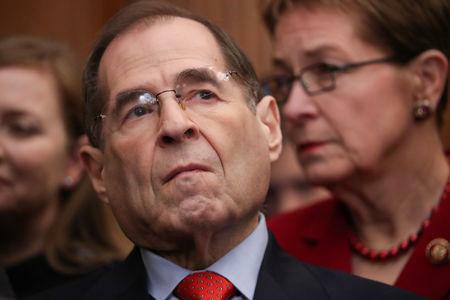 In a letter addressed to the White House chief of staff and acting homeland security secretary, the heads of the House Judiciary, Oversight and Homeland Security panels - Representatives Jerry Nadler, Elijah Cummings and Bennie Thompson - called the idea "a bizarre and unlawful attempt to score political points." "Not only does the Administration lack the legal authority to transfer detainees in this manner, it is shocking that the President and senior Administration officials are even considering manipulating release decisions for purely political reasons," the three lawmakers wrote. They set a deadline for the White House, the Department of Homeland Security, and the Immigration and Customs Enforcement agency to send communications, documents and memoranda on the subject to the lawmakers by May 3. On Sunday, White House spokeswoman Sarah Sanders told ABC News the administration had initially concluded the proposal was too logistically challenging, but the White House was contemplating its options because the president liked the idea. The House has been controlled by a Democratic majority since January, but the Senate remains in the hands of Trump's Republican Party. Several immigration proposals, including some backed by the White House, failed to receive the necessary number of votes to pass Congress when Republicans controlled both chambers of Congress. U.S. officers arrested or denied entry to more than 103,000 people along the border with Mexico in March, an increase of more than a third over February and more than twice as many as in the same period last year.